At least I had some comic relief in the dairy section. I overheard one shopper ask another, “Are you going to take all of them? ?” Apparently, she was referring to the latest craze in the grocery world: Greek yogurt. This particular brand had been flying off the shelves and it wasn’t the first time that I noticed customers making a beeline for the yogurt section. What cracked me up was the woman’s cordial, yet unapologetic, response to the other woman’s question of whether she was buying up all of that particular flavor of yogurt: “Yeah. It’s my favorite.” Fortunately, before the situation got too heated, a nearby store employee stocking the shelves assured everyone that he had more in the back. Phew, crisis averted. Fast forward two years and here I am, storming the Greek yogurt shelves with the other crazies shoppers. I tried to hold out, but since I discovered that I actually like it, I’ve been stocking up whenever it goes on sale for $1 or less (because really, $1 or more for a 6-ounce yogurt seems excessive). I’m still trying to figure out the craze and whether it’s only a fad until the next “superfood” comes along. All cynicism aside, count me in as a Greek yogurt convert. I’m all about the extra protein, although I don’t like how some yogurts have a high sugar content. You can weigh the evidence and decide for yourself. Side note: I have to credit this year’s Girls’ Weekend with inspiring my latest (hopefully healthy) breakfast routine; it’s how we started each morning. Below are some of the countless yogurt/fruit/granola combinations I’ve tried in the last several weeks. So far it’s the only breakfast that doesn’t leave me hungry an hour later, and I’ve been a lot less cranky when out and about with my 5-year-old near lunch time. Strawberry Banana Smoothie – vanilla yogurt, strawberries, bananas, and granola with dried banana chips. Fresh peaches work, too. 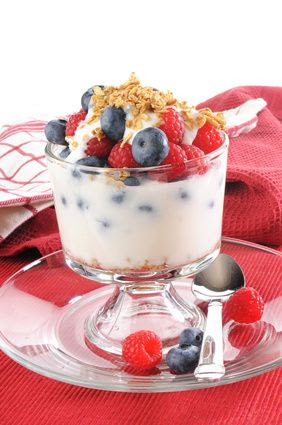 Berry Bonanza – Dannon Oikos raspberry yogurt with any combination of blueberries, strawberries, even more raspberries, and low-fat granola. Tropical Paradise – Chobani pineapple yogurt with bananas, kiwi, and Nature’s Path Love Crunch “Aloha Blend” granola. Just Like Apple Pie – Chobani apple cinnamon yogurt with apples, and granola with raisins and almonds. Dessert – Dannon Oikos key lime yogurt, sometimes with raspberries, but it’s good enough on its own. Oh look, those were five combinations. I didn’t neglect the Friday Five after all! I know I’ve forgotten a few, and I could go on listing different mixes, but feel free to experiment with your favorite flavors. Enjoy! Disclaimer: I’m not compensated in any way for talking about these products. They’re all my own opinions. I actually make my own yogurt, so I know just how much sugar (none) there is in it :). Sometimes I then add 1 teaspoon of maple syrup. I also make the Greek kind occasionally by allowing my yogurt to drain in a sieve overnight. Sounds good! I love maple syrup. If only I weren’t so lazy in the DIY department! Chobani sure is delicious…my favorite is the banana and strawberry combo. Yum, one of my faves as well. “Chobaniacs!” I love it. Definitely worth investigating. Thanks for the tip. In this write-up I am heading to give you some ideas to assistance you convince your Father to acquire you a doggy. to carry home a different addition to your relatives, you may certainly want it to be happy and healthier!